People do all sorts of things for a bit of fame. This man is no different. However, his pursuit of setting a world record is a bit drastic and extremely dangerous. Known as 'Hammer Head', John Ferraro is famous for using his forehead to hammer in nails. Insane! 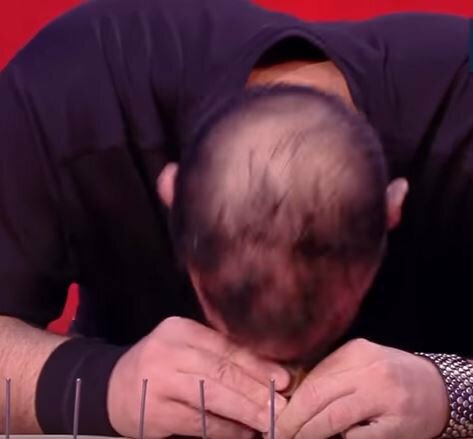 In his recent appearance on Guinness World Records Italian Show, Ferraro pounded 38 nails into a board with his skull in under two minutes.And if you thought this was the first time he has done this, think again. According to Huffington Post, he also holds the one-minute record of 13 nails, and the world record for 'Most concrete blocks broken on the head with a bowling ball in three minutes'. But don’t be fooled into thinking you can try this at home. Ferraro’s skull is thicker than a normal human skull, literally! Daily Mail reports that his skull is 16 millimeters in thickness, compared to the average of 6.5 millimeters. See Ferraro pounding in the nails below. It will make you cringe.